Meet Liz a 1000% certified mommy blogger. Liz and I met in person thru work as we both were part of the very large global digital marketing team. But her reputation preceded her. Liz made her first impressions upon me with her ‘pre mom’ blog and social media. She lived a picture perfect life as the definition of a “lifestyle” blogger in the early 2010s when she was a newlywed expat in Amsterdam. Today Liz stays at home with her two kids and is building up a really solid personal brand creating really relatable and yes ‘picture perfect’ images for her feed, partnering with brands big and small. On the surface level Liz might come off as your typical or dare I say ‘basic’ instamom. But what is great about Liz is her writing. She worked as a copywriter and by reading her posts you can tell. She shares anecdotes and tells stories about raising her children in a really honest and vulnerable way that is super genuine. Recently I have enjoyed a lot of her commentary and posts on gender stereotypes and the unexpected dialogue she has opened up with her followers about that. 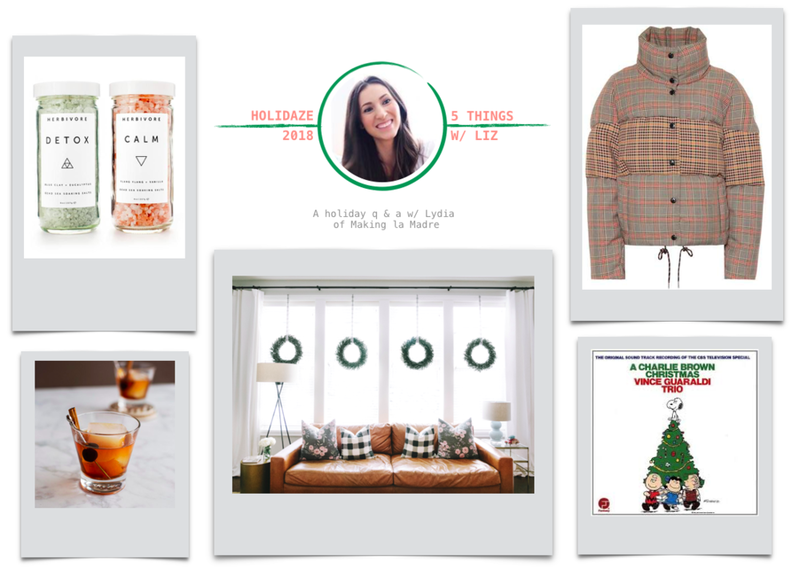 Meet Liz below and read her 5 things for this holiday season. LL: Number 1, fave holiday album? LL: Number 2, go to holiday drink? LL: Number 3, what will you be gifting your girlfriends this year? LL: Number 4, fave piece of holiday decor? LL: Number 5, what is at the top of your personal wishlist, besides world peace of course? Thank you so much Liz! After putting this together it reminded me that I think you were my first ever guest post on the blog four years ago right before Momo arrived. Click over HERE for a trip down memory lane. As for a puffer YES YES YES. I love them so much. I picked out the Moncler one as imaged above. Its def on the ‘wishlist’ instead of a ‘reality list’ at that price point but I think you would look great in it. More moms coming at you this week and next!